rubber or any other non-metallic materials. PCB oils or containing items such as ballasts, transformers, fluorescent lighting or capacitors. Ammunition (ordnances) or explosives of any kind, unless managements approval in place. Asbestos or asbestos-containing materials, such as insulation from pipes, wiring, tanks or other industrial materials, gaskets or siding/surface materials. Mercury-containing lights or related fixtures. Compressed Cylinders that are not open to atmosphere and verified to be safe MUST be rejected as per the updated Compressed Cylinder Policy. Compressed Fuel Automobiles – Any vehicle with attached compressed fuel systems (propane or natural gas) must have the systems decommissioned & confirmed to be empty. 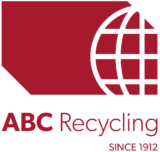 Should you have any questions regarding your materials please don’t hesitate to contact your ABC Representatives for further clarification.